Back Pain ! A 10 year Struggle. Like many other people in the world, for the last 10 years I have struggled with ongoing back pain. It started for me in the early summer of 2007. I was@ work and had to move a(full as I could get it" )wheelbarrow of sand that I had just swept up in a machine shed. I picked it up and went and dumped it .As the day progressed I started to have pain running down my legs. I was working in the wood shop that afternoon and it just kept getting worse, by the time I got home I was hurting pretty good. I sat down on the couch and that's when things really went south fast. I instantly went into muscle spasms and had pain shooting down my legs. I went to the Dr and they did @ MRI and came back bugling disc @ L5 S1. I was off work 6 weeks. Since than I have had numerous bouts of on again off again back pain. I have had 5 MRI's done and seen various surgeons all with the same response " it just isn't bad enough to warrant surgery" and . "It does make contact on the nerve root , but it is not compressing it", (oh if I had a dollar for every time I heard that),anyway , I have tried the entire gamut of back pain relief, chiropractors,massage therapist, epidural injections, drugs,physical therapy etc... Recently I was reading an article online about a condition known as the back mouse . It involves having a fatty tumor or lipoma in the lower lumbar region of the back . I have had a fatty tumor on the lower part of my spine for as long as I can remember,and when ever I would ask the Dr about it they would say "It is harmless and not to worry about it" and "it would not have anything to do with my back pain". After reading the article( "which totally described me" ) I began to apply pressure to my lipoma with my fingers and could instantly cause shooting pain down my right leg and low back! I contacted my Dr ,made an appointment and told her what I had discovered! She recommended a local surgeon she liked and sent a request for me to see him. Well 3 weeks later I was able to see him. He looked at it and ask me if I would like to have it taken out and I said Yes I would and He said Ok and last Tuesday it was removed. 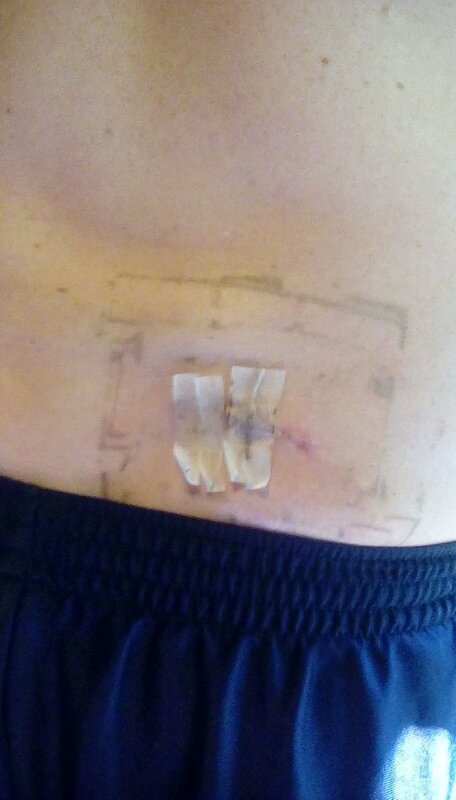 The surgery went well and they removed a golf ball sized fatty tumor from near my lumbar spine on the right side. One week after surgery and here is how it looks. It has been healing nicely and I will continue to update my progress as time goes on. It is my hope that threw this post many can be helped! Well I ,am @provider ( aka Bo Duke) and keep on enjoying Gods beautiful playground! Praise the Lord. Hope this trial is over. Thanks brother, I am praying this will end it ! I hope this surgery fixes your back pain once and for all Cousin Bo. My wife has suffered with similar pain for about seven years now with the Doctors telling her there does not appear to be anything wrong. I will mention this to her and perhaps she can also find a cure. I'll add a little prayer that you will both soon be pain free. Thanks Luke , I will be praying for her also. I know the struggle of pain and what it feels like , when it seems their is no where left to turn. We serve a mighty God and he is faithful. Bo! What happened? Why did they disqualify you from the Steem-pocalypse contest? They said I replied to your comments instead of papas! Yeah, I checked the times you posted and they were all well within the 24 hour window. I'm sorry you were disqualified. The contest won't be much fun without my cousin. Thanks Luke! I hope you win!